A curious payment of N2, 922, 236.310 to 54 Senators during the tenure of Chief David Mark as Senate President is now engaging the attention of the Economic and Financial Crimes Commission (EFCC). Each of the Senators is believed to have received N45, 509, 090. It is one of the issues Senator Mark is expected to throw light on during his ongoing interactive session with the agency, The Nation learned authoritatively yesterday. Five of the 54 Senators that benefitted from the N2.9billion largesse are still members of the Green chambers of the National Assembly. Among them is a principal officer of the Senate. While investigators suspect that the money may have been sourced from the accounts of the National Assembly, citizen Ifeanyichukwu Obazi-Nweze, in a petition, claimed that it was trapped cash of the Peoples Democratic Party (PDP). The discovery of the cash disbursement by EFCC is believed to have sparked the latest move by some Senators to block the re-nomination of Mr. Ibrahim Magu for confirmation as substantive Chairman of EFCC. The lawmakers are said to have drawn the battle line with him. Sources said yesterday that they planned to send a 15-man secret delegation to Buhari to protest against Magu and demand his removal. Investigation by The Nation showed that the ex-Senate President and some of the beneficiaries of the largesse will have to explain who authorized UBA to raise five manager cheques in favour of the defunct Bank PHB and GTB. The manager cheques were listed as MC No. 03816905 (N2,275,454,500)- Bank PHB; MC 03816915 (N133,400,000)-Bank PHB; MC No. 03816909(N103, 800,000)-Bank PHB; and MC No. 03816918(N364,072.720)-GTB. Investigation showed that each of the 50 beneficiary Senators collected N45, 509, 090 amounting to N2,275,454,500. A document, obtained by our correspondent, reads in part: “The above manager cheque number 03816905 with a value of N2,275,454,500 was deposited into the accounts of 50 Senators as beneficiaries. “Manager Cheque No. 0386915 of the sum of N133, 400,000 and MC No. 03816909 of the sum of N103, 800,000 have four beneficiaries as follows: N133, 400,000; N51,900,000; N86, 250,000 and N51,900,000. 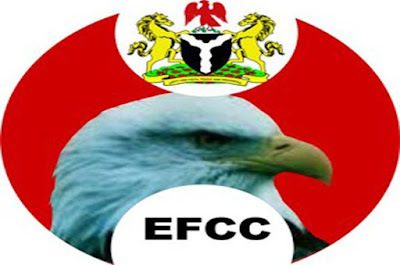 The source said EFCC commenced its investigation into the matter in 2015 following petitions by National Assembly workers and one Ifeanyichukwu Obazi-Nweze of Abogu Financial Company Limited who claimed that the money was trapped cash of the Peoples Democratic Party (PDP). “The probe is not targeted at David Mark or the Senate or the nation’s 109 Senators,” the source said. “Yet, no anti-graft agency will gloss over N2.9billion shared by 54 Senators in one day. “It is a case which preceded the eighth Senate but as we probe on a daily basis, we dig up more facts on how funds were siphoned from the coffers of the National Assembly into private accounts. “Contrary to the claim that the cash amounted to trapped funds of PDP, our team succeeded in tracing the source of the money to the account of the Senate and how it was deposited or transferred to the accounts of the affected Senators. A reliable source said: “Some of the 54 Senators have drawn the battle line with the acting Chairman of EFCC, Mr. Ibrahim Magu and have vowed to unseat him. They know they collected illegal money and may have to refund same. “Already, they have raised a 15-man team to have audience with President Muhammadu Buhari on why Magu must be removed for looking into N2.9billion fraud. They are afraid of their shadows because the ongoing investigation is leading to more stunning discoveries.